When MOVING WINDOWS: MONSTER MADNESS by Brenda Sexton arrived at my house, my son just about had a heart attack. Not only was it a book about Halloween (which by itself would be very exciting this time of year), but it also had a button on the front cover that caused all sorts of things to happen - eyes on the bat and pumpkin light up, a witch's voice cackles, and images move around in the big window. I can tell you that Booking Son just loved this book! He couldn't keep his hands off of it! Of course, I had to read it to Booking Son right away -- how could I resist when he was so excited? He loved the illustrations, and I have to agree that they are absolutely adorable. The colors are bright and the Halloween characters have big eyes that definitely made us smile. He also enjoyed the story about the different characters getting ready for Halloween, and he thought the rhyming prose was catchy too. To make things even better, the book had a pop-up surprise at the end. 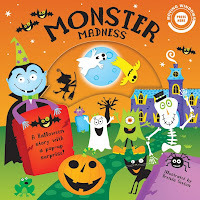 I think MONSTER MADNESS is absolutely perfect for this time of year and I can guarantee that preschoolers are going to love this precious book! Thanks to Media Masters Publicity for providing us with a copy of the book. I know I always used to love books that had moving parts. This sounds wonderful! I like to buy books like this for other people's kids!